Electronic toll services represent the major league of traffic telematics. 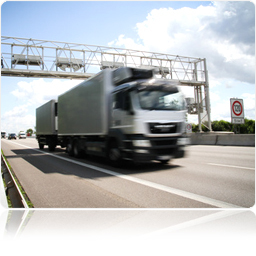 omp is the primary supplier of distributed software (on board equipment, location augmentation gantries, service PCs) of the German Toll Collect system. Since 1993, we are concerned with the topic of electronic toll collection, participating in early field test and trials with significant contributions. This comprehensive experience was an important factor for the eventual success of the German solution. 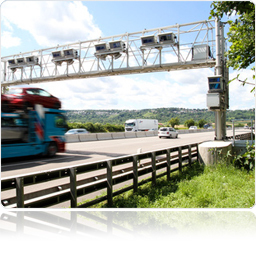 Due to the high complexity of the still internationally genuine GPS/GSM-based German solution and its high reliability, omp is a valued partner for the design and development of tolling solutions. Specifications of Interfaces, OEM APIs, complete OBU software implementation with processes, embedded systems database, smartcard integration, locating etc. Clients and databases for the processing and administration of digital street maps, generation of proprietary operating data. Design of software and databases, implementation. for the validation of locating and payment processes and their operating datasets. Design of the software and databases, implementation. Design of the software and processes/protocols for the location augmentation of the OBU in areas with insufficient GNSS coverage, implementation. Development of the application, rollout in Europe, maintenance and support. Specification of hardware components, smartcard and software, implementation, validation.